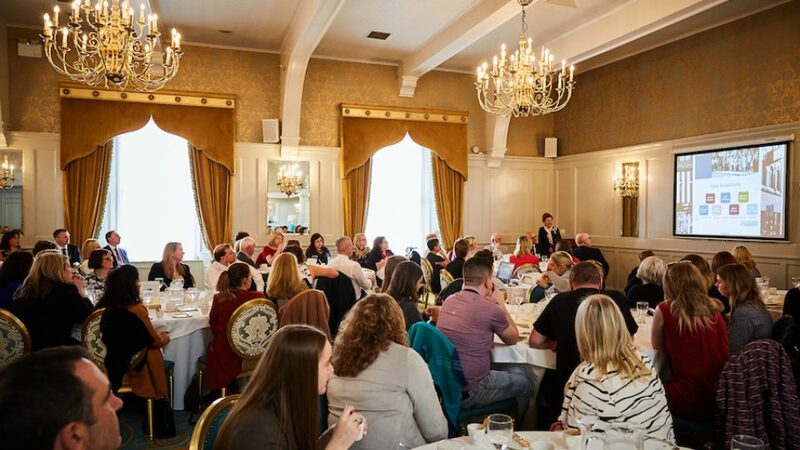 When Ennis Chamber invited Breege O’Donoghue to speak at a luncheon event, we weren’t entirely sure she would say yes, but we were certain that if she agreed to speak she would come armed with pixie dust to inspire all who attended, and she did! Those fortunate to have a place at the packed event on September 7th at the Old Ground Hotel, left the room sated but also imbued with the belief that all goals are possible, even hugely ambitious ones. Breege’s presentation was a tonic and in the words of Ennis Chamber President, Diarmuid McMahon, “made everyone from Clare sitting in the room feel particularly proud of the achievements of this outstanding Clare-born business woman”. Breege told the impressive story of Penneys growth and internationalisation. She joined the business in 1979 as Head of the newly established HR department and later became board director with responsibility for new markets and overseas expansion. She stayed with the business for 37 years and today continues her involvement in an ambassadorial role. The journey for Penneys was not without challenges and these were addressed head on by Breege in her comprehensive presentation. Her parting shot to the business people gathered in the room, was to follow the Penney’s mantra “think global and act local”. The occasion and Breege’s effect is best summed up in the words of some of those who attended. Empowering. Phenomenal. A whirlwind. Inspiration.